It turns out my PC isn’t completely toasted, just my graphics card which was the oldest component in this current build. I think I’ve had this card for at least 5 years and at the time it was the best I could afford; a PNY GeForce 9600 GT XLR8 with 512MB of DDR3 RAM, which incredibly is still listed on Play.com. 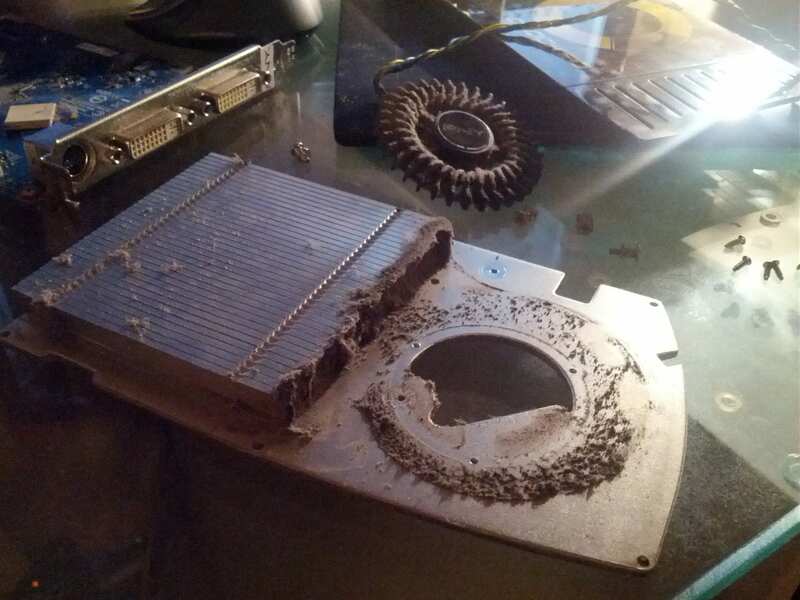 It would appear that spending in excess of 5 years sucking up dust can lead to the heatsink getting completely blocked. This doesn’t make for particularly good heat dispersion, and this hard working trooper of a card has paid the ultimate price. You will be missed, loyal friend. Getting by using on-board graphics for the time being and there’s no other signs of heat damage so far.